But the best part of this dish? It’ll be on your table in under 30 minutes. I have been able to find squid ink pasta at Trader Joe’s or in some of the local Portland specialty stores. However, if you’re having a difficult time finding it where you are, you can always substitute plain pasta, or order it online. I’ve found that the fresh squid ink pasta has the most flavor, while the dry pasta flavor is less noticeable. The squid ink is what gives the pasta it’s gorgeous black color, it also gives it an amazing flavor. Squid ink pasta has a rich, briny flavor with the faint hint of sea saltiness, which makes it absolutely perfect for pairing with seafood. I made a simple sauce with cherry tomatoes, shrimp, basil, lemon and a pinch of red pepper flakes. I wanted to keep things simple so that the flavor of the pasta could really shine. 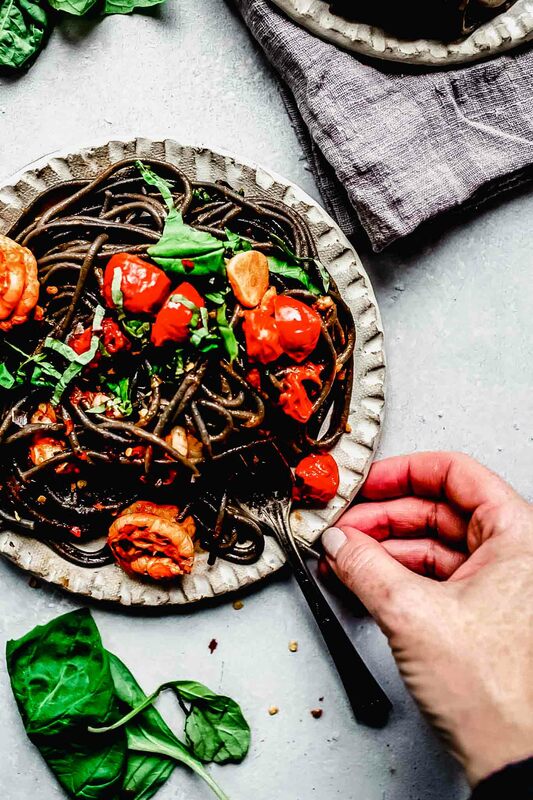 This recipe for Squid Ink Pasta with Shrimp & Cherry Tomatoes only looks fancy. It's easy to make in under 30 minutes and the flavor is delicious! In a large skillet heat olive oil on medium-high heat until hot. Add the garlic. Cook, stirring occasionally, 1-2 minutes, or until lightly browned and fragrant. Add the tomato paste. Cook, stirring frequently, 30 seconds to 1 minute, or until dark red. Add the cherry tomatoes, white wine, ¼ cup water and red pepper flakes; season with salt and pepper. Cook, stirring occasionally, 3 to 5 minutes, or until tomatoes are softened. Cook the pasta to al dente, reserving ½ cup of the pasta cooking water, drain the pasta. While the pasta cooks, add the shrimp to tomatoes; season with salt and pepper. Cook, stirring occasionally, 2 to 3 minutes, or until cooked. Add the cooked pasta, butter, lemon zest, lemon juice and half the reserved pasta cooking water to the skillet with the shrimp & tomatoes. Cook, stirring frequently, 2-3 minutes, or until the pasta is coated in the sauce; season with salt and pepper to taste. (If the sauce seems dry, add in some of the reserved pasta cooking water to achieve your desired consistency.) Turn off the heat and stir in half the basil. If you loved this Squid Ink Pasta I would appreciate it so much if you would give this recipe a star review! Also, be sure to snap a picture of your finished dish and share it with me on Instagram using the hashtag #platingsandpairings and tagging me @platingsandpairings. This post was originally published in 2015. It was updated in 2019 to update the content and photos. The recipe remains the same. You’ll have leftover tomato paste if using a can. Put those leftovers into a baggie and stick it in the freezer. Pull it out and thaw it under warm running water whenever you need tomato paste. A zester is a super handy tool – Use it for zesting the lemons in this recipe, or for grating cheese or nutmeg. Opt for a lively white wine such as an Italian Verdicchio or a Pinot Gris from Oregon. 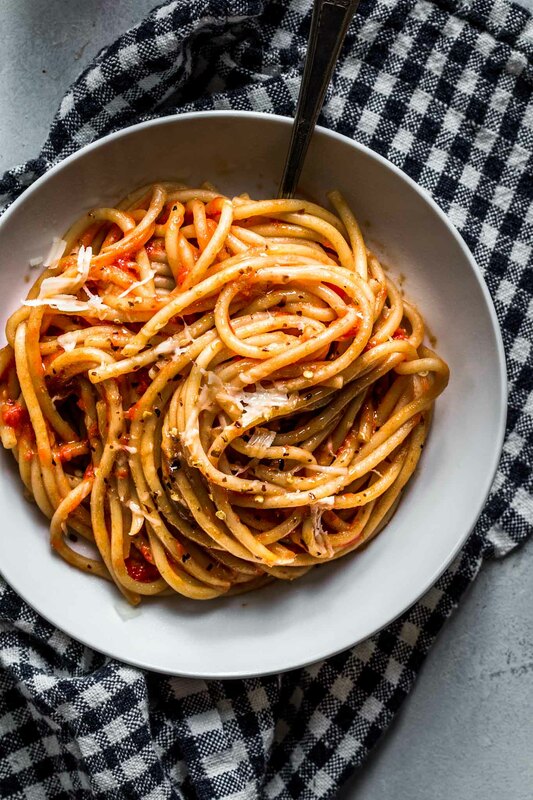 A light-bodied, acidic red wine such as a young, slightly chilled Chianti will work well with the tomato sauce in this recipe. I had squid ink pasta for the first time in Venice when we were there a few years ago — I fell in love with it, but have had a hard time finding where I live. Love how you kept this so simple – the flavors sound delicious and it’s just beautiful to look at! PS Jealous about Amazon local — wish we had it here in NC! 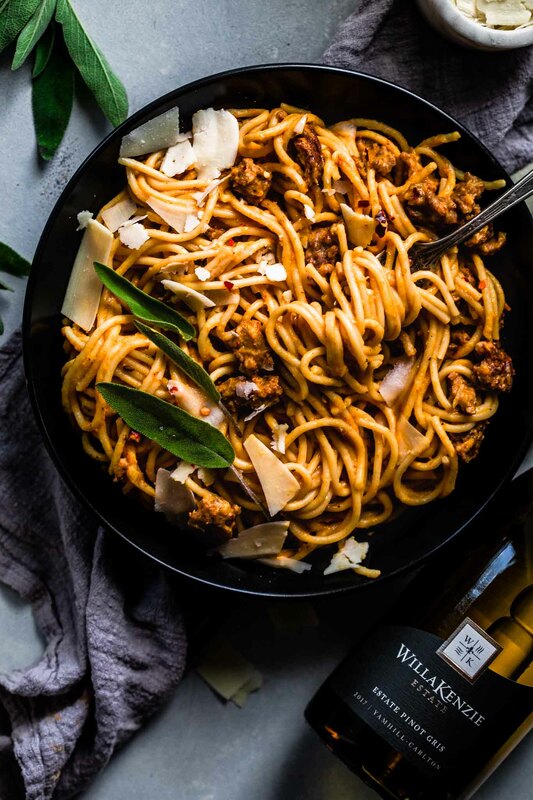 I’m SO excited about this pasta AND Amazon Local – Hopefully it will be more widely available soon 🙂 So jealous about your trip to Venice – I would absolutely LOVE to go there someday – Bucket list! Love the beautiful contrast of colors with the shrimp here, and great tip on how to use the leftover tomato paste! Thanks Pech! Tomato paste is cheap, but it’s nice to store leftovers in the freezer, because you never know when a recipe will call for it! Squid ink linguine sounds fascinating!!! I need to buy some and try it! Yes Susannah – Yes you do! It’s delicious!!! Love the gorgeous pops of color in this dish! I haven’t made squid ink linguini but will have to try it at home now. Thank you Marlynn! I was thinking it’d be appropriate for Halloween with all the black and orange! I admit I’ve always been a little nervous about trying squid ink pasta. But this looks and sounds so good that I might try to get over my fear and do it! we were in Sardinia just a week ago and found squid rice and pasta, it was so yummy, had to keep going back to the restaurant to have more. Delicious, now that we just got back we are already looking to cook it. I’m obsessed with it too!!! Love squid ink anything – especially black rice dishes! Looks delish! I love squid ink pasta, it’s such a unique flavor. Isn’t it great Chloe! I love the color too! This looks so interesting and tasty! Yum! Hello! I am so glad I stumbled upon your blog this afternoon! 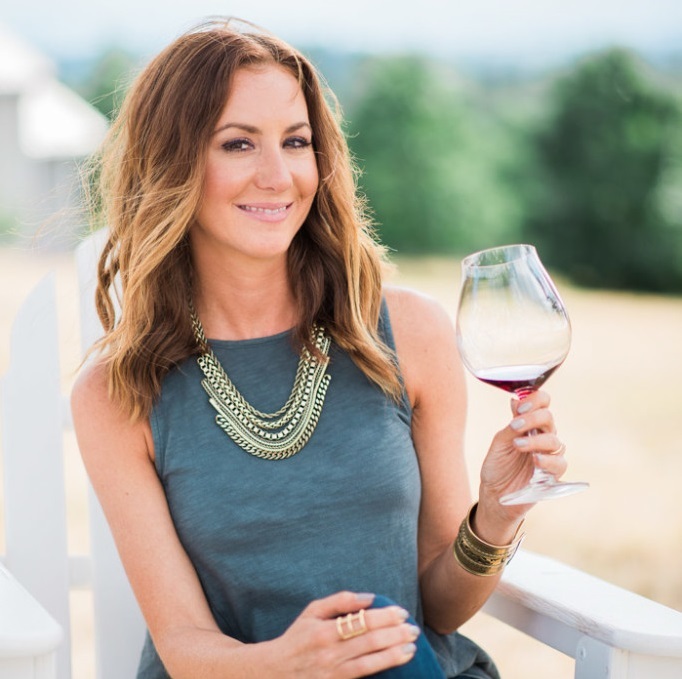 I live in San Francisco but I travel up to the PNW every week, so I love finding “local” bloggers. This recipe looks DELICIOUS – so many good flavors going on!! Thanks Dani – That sounds like a lot of traveling, but I’m sure that you get to go to some pretty great places. Cheers! If you told me what this was I may not try it, UNTIL I saw how beautifully you’ve prepared it; very nicely done!! Squid ink pasta is a new one to me, but since I love pasta and seafood, I have no doubt that I’d enjoy it. I’ll keep my eyes open for it. I’m sure you’d love it Renee! Ooohhh – you are SO lucky Florentina! Jealous!!! Seafood lovers will be over the moon for this dish. It looks amazing! Diane – It’s definitely a great dish for true seafood lovers! Wow, I did not know that squid ink pasta exists! This is such a beautiful recipe! Thank you Sara – It’s such a unique, fun ingredient! Wow those colors are striking! Thanks Catherine! I think that’s the best part of the squid ink pasta! Ooh I have to get my hands on some squid ink linguini. It looks wonderful! Thank you Thalia! It’s very, very yummy – And just SO pretty! Good luck to you in finding some locally! You can always order online too! 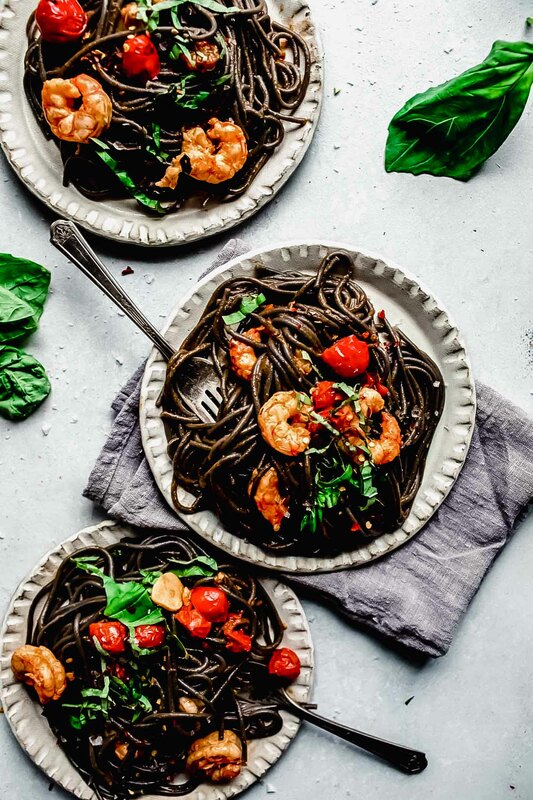 I have never tried squid ink pasta but after looking at these pictures it makes me want to go buy some! Seeing this pasta makes me so happy. 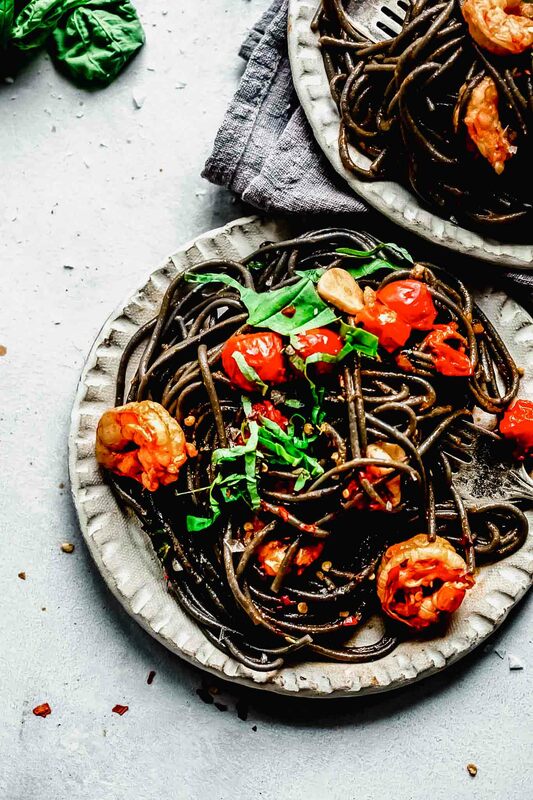 I love that you used squid ink pasta – so fancy! The only time I’ve ever seen this made was on Iron Chef. Now I have to try this recipe!! Sam – I hope you do give it a try! 🙂 You’ll be even happier after you eat it! Haven’t tried Linguini before and now I am curious. Beautiful photos.Erin. I don’t think there is a pasta I don’t like! This is a delicious pasta, love the combination. Of course Rosemary – You are a true Italian!!! my brother loves squid ink: must make this linguini for his bday! What a great sister you would be Claudia! Thanks Marye! I hope you give it a try! You can always freak out unsuspecting dinner guests with it! The colors are amazing and very inviting. Looks delicious. Aren’t the colors the best Tina? I have never tried squid ink pasta but it has always intrigued me! It sounds and looks good! Great share! Thank you Chris 🙂 Definitely give it a try! Well I am going to be looking for squid ink pasta now! Those colours are amazing! I love the contrast!! Looks delicious as well! I have never heard of ‘Squid Ink Pasta’ but looking at your recipe, I would definitely eat this 🙂 Looks so pretty and tempting. I love the contract that the squid ink linguini provides. Just a beautiful plate! Thanks Patti – The color is great, and it deepens as it cooks rather than losing color! They sell squid ink in packets like ketchup here in Spain. It’s really popular in rice dishes. Love the color in your pasta! That sounds amazing Lydia – You are SO lucky! Such an interesting and vibrant looking dish! I was always skeptical to trying squid ink linguini, mainly because of its color. Silly me 🙂 Paired with seafood and tomatoes looks so inviting. Thanks for sharing it. Of course Oana – I hope you try it and love it! I love squid ink pasta – this dish looks so pretty and elegant. 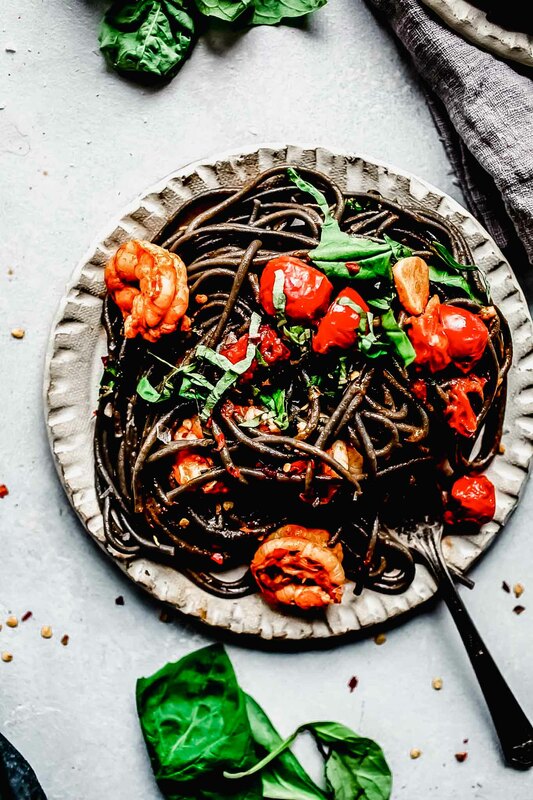 I am so intrigued by the squid ink pasta- I’m going to have to find some and try it out! Beautiful dish!! Yum! I love squid ink pasta. It really allows the other ingredients to pop against the dark color. It sure does, doesn’t it?! Erin I’m impressed! This looks super good obviously. Thanks for sharing! Never ever in my life have I ever had squid ink anything! I’m a wee bit afraid to try! Don’t be scared Whitney – Give it a try. I think you’ll like it. If not, feel free to substitute plain pasta for the squid ink version. Any excuse to eat more shrimp, please! This is absolutely beautiful! It sounds delicious! You are so lucky to live in a place where you can find exciting ingredients like squid ink. Here in WV we are very limited in that area, but this dish looks amazing. Yes – We are VERY lucky here in Portland! Lots of great small shops and gourmet grocery stores! I love ordering ink squid pasta in restaurants however have never actually made it at home – you’ve officially inspired me to do it!! 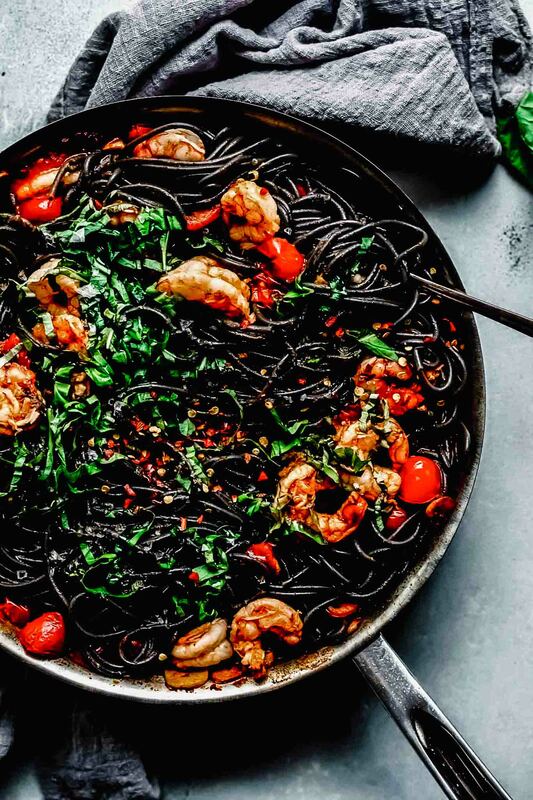 I’ve never had Squid Ink Pasta and that looks so delicious that I really want to go look for some. wow that intense and beautiful color of the squid linguine is amazing, such a fun way to change the routine pasta dinner. What a beautiful dish! Would have to order the squid ink pasta, as I’m sure I wouldn’t find it around here — if only Amazon Now was available everywhere!! Sounds awesome! Thanks Whitney – Amazon Now is definitely a fun new service – Hopefully it will be more widely available soon! I never heard of squid ink pasta before. What amazing color and your photos are lovely! Thank you Michelle – It’s a bit of a rare ingredient, but I think it’s quickly gaining in popularity! I love shrimp pasta! Seafood and pasta is one of my favorite combinations! Wanna hear something crazy? I have NEVER had squid ink pasta! Say WHAT?! Blasphemy for a chick growing up along the Pacific Northwest coast eh? I need to give this a whirl. SOON! Gorgeous photos, as always Erin! 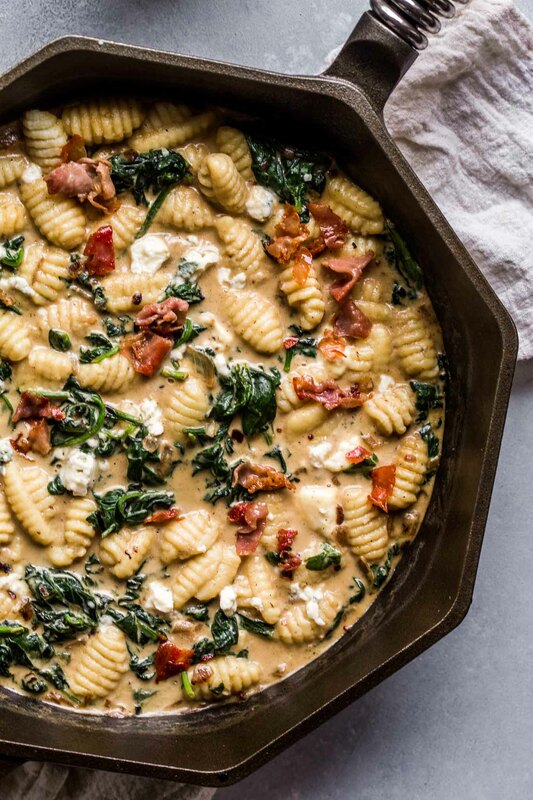 This is such a stunning recipe! I love what a great statement piece squid ink pasta makes. Thanks Sandra – I agree, the colors are really striking! I love seafood with pasta!! Great recipe 🙂 Thanks for posting! You’re welcome Chrissie – Enjoy! This sounds amazing! I have a question though, you mention clam juice? and when do we include the white wine? Hi Paloma – Thank you for catching this! I had revised the recipe to use white wine instead of clam juice (because who doesn’t want more wine! ), but forgot to adjust the recipe accordingly. It has now been revised. However, you can always swap out the white wine for the same amount of clam juice if you prefer. So glad you liked it Joey! This isn’t one of my most popular recipes, because I think people are a bit intimidated by squid ink, but I think it’s just delicious! So cool that your noodles came all the way from Japan too! I included a variation of this dish in an Italian dinner for six people at my house that raised $4,000 for charity. It was delicious…I used Scampi. That’s amazing Don – Great job! Squid ink pasta is beautiful looking stuff. I know just the person who would appreciate this dish. It’s a super quick & easy recipe! That sounds fascinating! It definitely makes for a stunning presentation. I bet it would be good with Greek wines, especially those from Santorini. They tend to have a very sea-like, briny, flavor that seems like it would work great with this dish. Great recipe! Under 30 minutes is a little misleading. It’s less than 30 mins AFTER you’ve prepped everything, zesting the lemons, slicing garlic, chopping basil, etc. Still, quite tasty and will definitely make again.